When Huntersville author Debbie Buttar left a lucrative job in nutriceutical sales two years ago, it wasnt so she could write a book, but rather so she could care for her son. Yet, thanks to a few ordinary - and not so ordinary - events the past few months, Buttar's role as stay-at-home mom to three-year old Rahan and stepchildren Abie (9) and Sara (15) has blossomed into that of childrens book author and publisher. 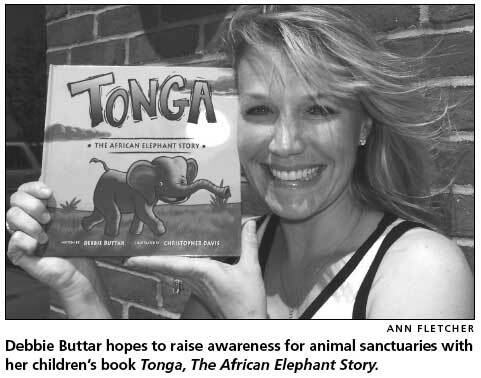 Buttar's first book - Tonga, The African Elephant Story - was printed in March and is one of several childrens books she plans to offer through www.ChildrensStoriesThat Teach.com. Inspired by an elephant sanctuary in Tennessee, "Tonga" began as a verbal tale Buttar told her children when they requested "a new" bedtime story. Drawing on her love for animals and knowledge of several non-profit animal sanctuaries she supports financially, Buttar told a tale about African elephants that think theyre home in Africa, only to discover they live on a sanctuary in Tennessee, a place that feels like "home" just the same. After telling and retelling the story, Buttar decided to "see it on paper." She then e-mailed it to a friend in Pittsburgh whose connections to the print advertising industry resulted in an unusual birthday gift for Buttar: An illustration of Tonga, Kora and Zahara - the elephants in her story - created by graphic artist Christopher Davis. The events connecting this Huntersville mom to a career in childrens book publishing can be traced to an ordinary day in the life of Buttar and infant son, Rahan. Rahan was toddling around their Huntersville home while Buttar, whod taken a brief, six-week maternity leave and was back at work selling pharmaceutical strength vitamins to medical professionals, was on a sales phone call. Rahan stumbled, as new toddlers do, and bumped his head. It wasnt a serious injury, but Buttar, who scrambled between completing the call and attending to her son, made a split-second yet lasting decision. "I knew right then and there, I wanted to be there for my son," she says. Professionally, shed just completed a phenomenal year, having been named salesperson of the year and salesperson with the highest growth for the year, in a Southeast territory covering Tennessee, Kentucky, North Carolina and South Carolina. Additionally, her work fit well with her husband, Dr. Rashid Buttar of The Center for Advanced Medicine and Clinical Research in The Park Huntersville, a practice that treats adults and children who suffer from autism and cancer as well as "treatment failures" - patients for whom conventional treatments and alternative treatments have failed. Yet, despite the positives of her having her own career, Debbie Buttar left her job on good terms and settled in to care for her family, unwittingly opening new doors. "Although I love being a stay-at-home mom, publishing a book has allowed me to branch out and maintain my own identity," she says. Buttar contacted one of the sanctuaries she supports to inquire about sharing a portion of the proceeds from her book, but was surprisingly turned down. "They were already working with someone connected to the organization who was writing a book to support their mission, so they said, �Thanks but no thanks," says Buttar. Instead, Buttar's book supports a cause closer to home: children suffering from cancer or autism through a group of doctors led by her husband called AMESPA, The Advanced Medical Education and Services Physician Association Research and Treatment Foundation. Today, Buttar gladly takes Tonga to area preschools and libraries for story time, sharing both the story and the importance of caring for animals. Tonga, The African Elephant Story is available for $9.99 at www.ChildrensStoriesThatTeach.com (where a video link to rehabilitated elephants is available.) Youll also find her book on Amazon.com, BarnesandNoble.com, and Bordersbooks.com at a cost of $14.95. 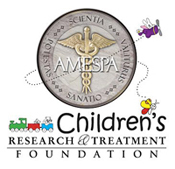 A portion of proceeds from all sales go to AMESPA. To schedule Buttar for a preschool or childrens group visit, call 704-506-3154 or e-mail her. "Tonga: The African Elephant Story" is about a group of three elephants - Tonga, Zahara and Kora - who set out on a journey "to explore the open plains of Africa." On their walk they see a horse, a red wolf, and a white-tailed-deer, among other animals. These do not seem to be animals native to Africa! Where are the hyenas, zebras, and lions? Cayden: "I liked when they went on their adventure to find the animals but couldn't find any of the ones that they were looking for. My favorite picture in the book was the one where they saw the bear catching a fish in the pond. It was fun to march around like elephants saying, "Ba -boom, boom, boom! It was really cool when we went on the computer and saw the elephant painting with his trunk!" Max: "I liked being an elephant like in the book. We stomped our feet and marched! I liked seeing animals." "Tonga: The African Elephant Story" is a cute story that my children truly enjoyed. As they stated, they loved to pretend they were the elephants searching for the animals and marched around the house saying "Ba-boom, boom, boom" like in the book. On the back cover it is written, "The details of this story were inspired by several non-profit sanctuaries that have provided home and protection to elephants rescued from zoos and circuses." I thought it was very unique to see a children's book told from this point of view. 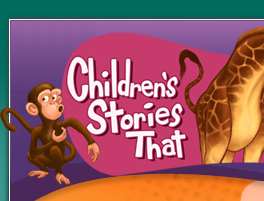 We also enjoyed visiting the book's corresponding website and learning different facts about elephants. The most fascinating feature on the website though was the link to rescued elephants painting self -portraits! 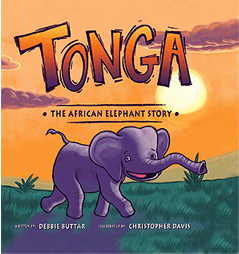 Reading "Tonga: The African Elephant Story" was a very enjoyable and educational experience for my children and we look forward to future books from Debbie Buttar! White-tailed Deer and Black Bears in Africa? Who Knew? Wonderful new children's book follows a young elephant's discovery of her new home - only to find out that everything is not as it seems. As only a young, curious elephant can, Tonga's enthusiasm to see the wild hippos, lions, and zebras in her native Africa has her bounding out of bed early one morning. But as she and her two friends uncover the secrets of the wild, she finds that things are not exactly as they seem. A black bear, splashing around for fish and a white-tailed deer, drinking out of a lake throws her for a loop. Where is Tonga, exactly? And can she be happy in a place that is similar, but not exactly like her homeland? In her new book, Tonga, The African Elephant Story, author Debbie Buttar takes children - and adults too - on a wild ride through the African plains...or is it Tennessee? Find out for yourself in this lushly illustrated, delightfully written book inspired by Buttar's support of elephant sanctuaries in America. The details of this story were inspired by several non-profit sanctuaries that have provided home and protection to elephants rescued from zoos and circuses. A portion of the proceeds from the sale of Tonga are being donated to the Advanced Medical Education and Services Physician Association Research and Treatment Foundation for the medical treatment of children suffering from cancer or autism.For more information, visit www.ChildrensStoriesThatTeach.com. 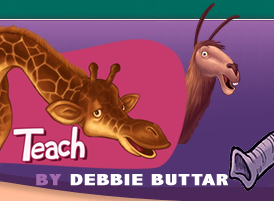 Debbie Buttar is inspired by animals and places that help them. Tonga, her first book, was inspired by an elephant sanctuary in Tennessee after she told her young ones a similar version as a bedtime story. She is married and has a young son, as well as stepson and stepdaughter. Her husband treats those with cancer and children with autism in his clinic. Proceeds from the sale of Tonga will go to a foundation to help children with autism or cancer and who are without healthcare. Christopher Davis liked to doodle cartoons growing up and later decided togo to the Art Institute of Pittsburgh to study computer animation. Afterearning his degree from the Art Institute he is now currently working in television as a graphics and effects artist. In his free time Christopher still enjoys drawing and other creative opportunities. TONGA The African Elephant Story, by Debbie Buttar (GMEC Publishing). Tonga is a curious elephant who thinks she is living in the African plains. But as she takes off exploring, she soon discovers that things are not exactly as they seem.